The Bodyworx LX7000HG Home Gym with leg press is one of the most compact & multi functional strength trainers available for your home. Stylish & clever design with a robust frame, this gym will provide you with years of hassle free training. 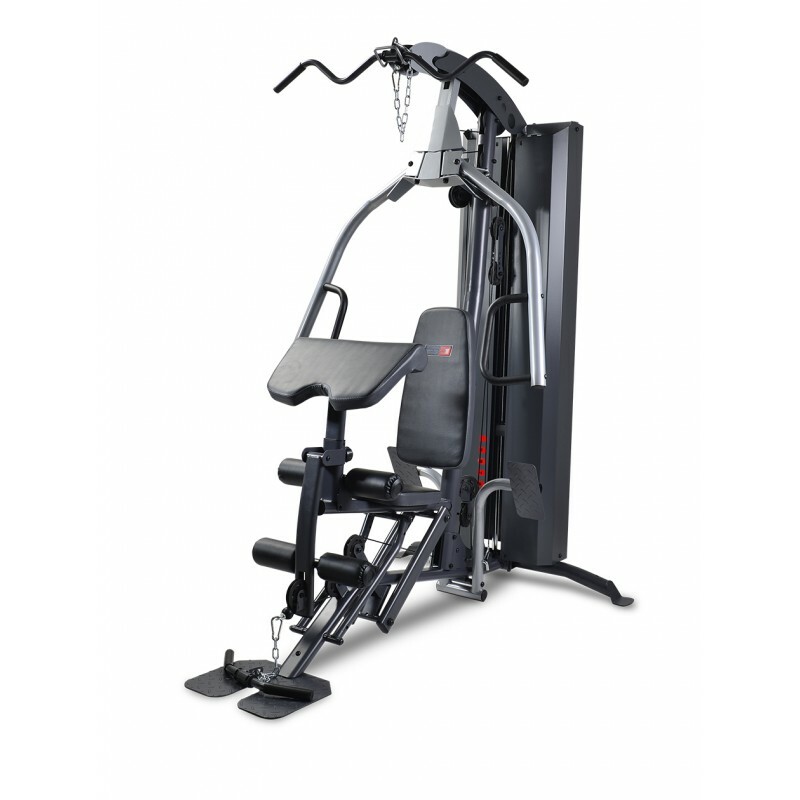 The integrated reverse leg press station has adjustable positions for the foot pedals for a custom fit. Due to the layout of the pulley system it can generate up to 180 KG (397 LBS) of resistance. 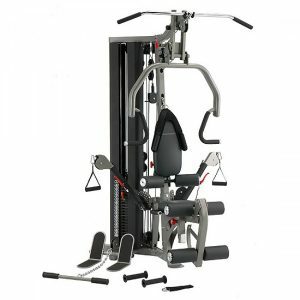 Also featuring a high pulley for lat & tricep exercises, a dual chest press & pec dec station with multi-grip handlebars, low pulley for row & leg exercises, leg developer & a height adjustable preacher pad for arm curl exercises which can be removed when not in use. 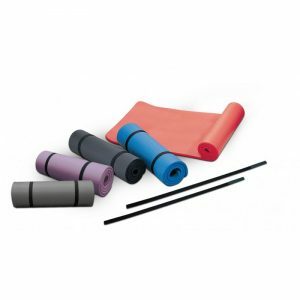 The design enables all major muscle groups to be exercised. 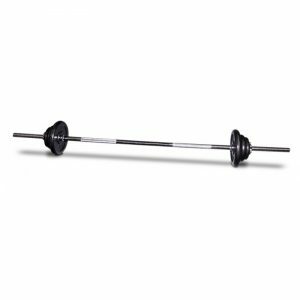 Heavy duty 50mm / 2” tubing on the frame combined with high tensile cables & 4” pulleys with sealed bearings provide for a safe, reliable & smooth workout time after time. The 2.5” high density vinyl covered foam upholstery provides support & comfort where you need it. Steel safety shrouds provide added safety from the weight stack & give the gym a professional look. Solid steel guide rods are 1” in diameter & combined with the sealed bearing pulleys ensure a smooth & safe operation of the weight stack. 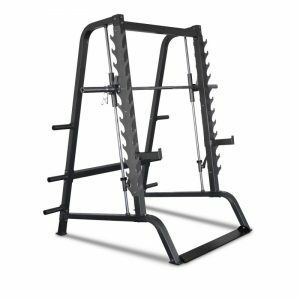 Attachments included: rotating EZ lat pull down bar with multi-grip positions, rotating short straight bar, single ‘D’ handle & adjustable velcro strap. Assembled Dimension: 155cm (L) x 115cm (W) x 207cm (H). Chest: Flat press, pec dec, single arm cross over. Back: Lat pull down, bent over row, seated row, reverse grip row. Shoulders: Lateral raise, front raise, rear fly’s, shrugs, upright rows. Biceps: Straight arm curls, high cable curls, close grip reverse pull downs. Triceps: Tricep push downs, single handle pull downs, tricep extensions. Legs: Leg press, leg curls, leg extension, abductor & adductor extension. ABS: High pulley AB crunches, oblique side bends, cable wood chops. Weight Stack: 76.5 KG (169 LBS).